First you need to download this add-on zip file (you will find link at the end of article), and install it from wp-admin / Plugins / Add New / Upload panel like any other WP plugin. Next, you will need to signup for Dropbox API key. You need to login in order to access this page. Once you do that there are three steps required to get your API key. Name your app – enter some app name. If your app name does not already exist then your app will be created and you will be redirected to success page. Scroll to the bottom, you should find there Chooser/Saver domains, enter there your site URL and click “Add” button. Next, look for App key and App secret codes. Copy App key, go to wp-admin / Settings (WPJB) / Common Settings panel and in “Dropbox App Key” field enter your app key. 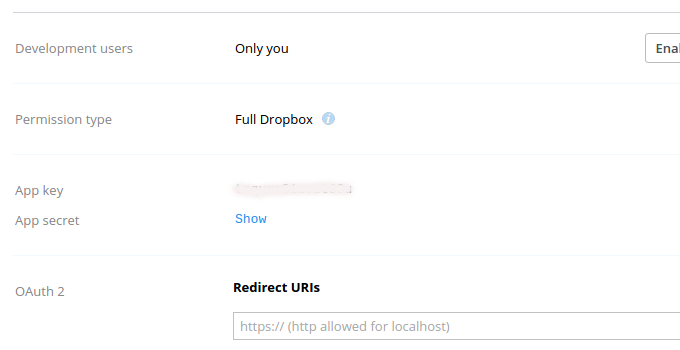 Save the form and now “Dropbox …” button should appear on all file upload fields.